Ever since I was a kid, I've wanted a Corvette. My uncle had a '77 and it was brown with gold pinstripes. I know, so very 70's right? I was pretty sure that when my mid-life crisis hit, I'd end up with cool 'Vette to tool around in. I was wrong. I ended up with a HEMI truck and a 30-foot RV with a slide-out. Man, did I get hosed! 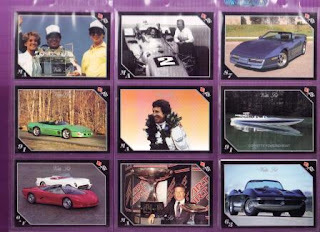 The 1991 Vette Set featured 100 cards with pictures of 'vettes, vette logos, and had a Mario Andretti subset built into it. I say that because the 'subset' was still part of the sequential numbering of the cards. The photos of the logos showed the progression and development of the different logos used over the years by GM for their flagship sportscar. The 'vettes themselves range from the original '53 to some 'futuristic' versions that bear remarkable resemblance to models that came after '91. Each card back features a write-up about the picture on the front, whether it's the Callaway Speedster, the 'vette-powered jet boat, or the historical relevance of the Andretti photos. I prefer to keep them in their pocket pages, safe from the drool.... Velocity Yellow... Yeah, buddy! I have the vette set also awesome cars. I use to drive a 76 stingray black it reminds me of the batmobile.Lotsa kick in that car.The shelby stang is wicked also.